Best health magazine gave us simple tips on influenza treatment to protect your family from the influenza virus. It has caused thousands of hospitalizations in the season. In this winter season, influenza arrived earlier than expected and as every year caused the hospitalization of more than 200 thousand people for influenza treatment. For this reason, best health magazine writer gave us basic advice to prevent this disease arrives in your family. Influenza is a type of virus that has different strains. Such as H1N1, AH1N1, AH3N2 and influenza B, which cause influenza. Maintain a healthy lifestyle to safe from all types of flu. The difference between common flu and one produced by one of the strains of influenza is that the symptoms occur suddenly and do not give up on anti-flu drugs. A person ill with influenza may have fever, chills, cough, sore throat, nasal mucus, stuffy nose, muscle aches, headache, and extreme fatigue. In some cases, it occurs with vomiting and diarrhea, especially in children. Influenza is a condition that must have immediate medical attention. It mainly attacks vulnerable groups even though they do not have health problems. There are groups of people who have high-risk factors for influenza. Such as diabetics, kidney problems, and people over 65 and children. These vulnerable groups are much more likely to suffer complications in the event of infection. Without influenza treatment, can turn into pneumonia, bronchitis or even something more severe. That is why prevention of infection at home is so important. It does not matter that the season has begun and is about to end. “The influenza vaccine acts immediately and can be requested during the outbreak,” said best health magazine writer. All people who are healthy and children older than six months can be vaccinated. Some of the precautions and the vaccine cannot be applied to people who have previously developed an allergy to eggs or the vaccine itself. It is very important to get vaccinated since specialists point out that the vaccine is 62 percent effective. That’s why it can be considered quite preventive. How to fight the flu? Teaching children to wash their hands and perform this activity also as adults are the first step. Ideally, wash with soap and water for about 20 seconds. We point out that a good technique for children to calculate the time they should rub their hands is to sing the happy birthday song twice. Disinfect commonly used objects. They are lying with germs. Such as children’s toys, tables, door handles, remote control, and telephones. The virus can live in the open for up to 72 hours. It represents a danger for the whole family. An effective protection recommended by best health magazine is the disinfectant wipes. Because the best quality products kill up to 99 percent of the viruses, including the influenza AH3N2, plus they are very practical to perform a daily cleaning routine. A basic five-minute routine that includes door handles, light switches, tables, and countertops, is very easy if you do it with this type of disinfectant cloths. Disinfect the outside. You should take this basic cleaning routine to your work to prevent your infection and take home the virus. To control the environment of children you can ask in their schools. What is the cleaning routine that is followed on the campus and donate disinfectant products? Another recommendation is that when sneezing do not cover your hands directly, with the inside of your elbow. So, the virus will not expose and will not have direct contact with your objects of use and other people. Caring for the general well-being also helps prevent infection. Eating well, exercising and sleeping enough hours help keep your immune system stronger. In future, diseases will not attack you so easily. When did the influenza season begin and until when does it end? The season began in October (almost two months earlier than expected) and that there have been about 3,700 hospitalizations, of which 46 percent were people over 65 years. Between December 30 and January 5, 47 states reported cases of influenza. Although the institution Centers for the Prevention and Control of diseases recently announced that the worst of the influenza season has passed. As cases have decreased in the last four weeks. The cold season officially ends until mid-March and infections they can still present. According to the Associated Press news agency, the spokesman of the CDC noted that ‘it is possible that the season is over’. However also pointed out that it is difficult to predict the tendency of the flu. Because, in previous years, the disease has had upswings in the last days of the season. 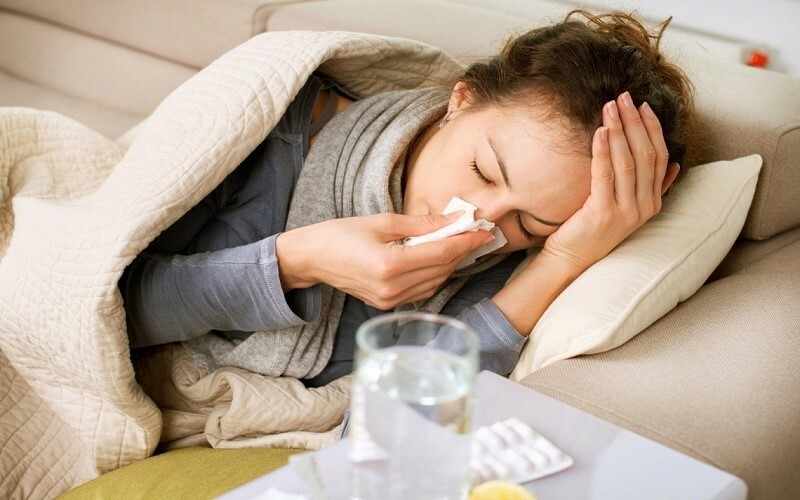 As influenza can be asymptomatic or present the symptoms of the common flu. It is advisable to be very alert in case the symptoms such as a headache and nasal discharge do not decrease with the medicines for the normal flu in maximum three days. Because it is time to go to a medical emergency, says the nurse. Also, green tea is effective for severe flu. In the case of children if vomiting or diarrhea occurs and there is a lot of weakness. It is advisable to go on the first day. So, you can prevent dehydration caused by stomach discomforts complicate more the picture of influenza treatment, said the specialist of the best health magazine.